One of the goals of our early childhood program is to lay a strong foundation for all later learning so that each child will succeed in school and life. 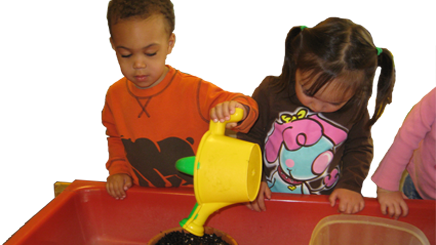 At Creative Beginnings, we feel that all children should learn at their own pace through a hands-on, active engagement with their environment. Early years are the formative years for learning and educators understand that young children need to touch, move, experiment, create, ask, pretend, interact, and observe in order to develop critical thinking skills and knowledge of their world. Our wide and varied choice of play activities encourages exploration and challenges each child to succeed and grow at his/her own pace. Each colorful and inviting classroom has various learning centers that have been prepared by the classroom teachers for the children to freely choose his/her own activity. Our daily classroom activities are centered around a theme based curriculum. The curriculum is designed as a framework for each teacher to plan the many interactive activities that are both appropriate and of interest to each child in that classroom. Many of the chosen themes are nature, science and animal based as young children have an innate interest in life and the environment they experience. An exploration of “bugs” or “trees” (as our three acre property lends itself to) gives the children an opportunity to investigate nature all around us. Develop a good and healthy self- esteem with a “can do” attitude toward self. Development of a strong conscience, with knowledge of right and wrong. Exercise self control and regulate one’s own emotions. Take responsibility for ones actions and behaviors. Develop an enthusiasm for learning new things. Develop friendship and promote kindness and caring for all others. Learn to share and compromise. Express ones feelings and ideas to others. Learn to communicate and resolve conflicts in acceptable ways. Acceptance of all others, no matter what the differences may be. Respect and caring for the environment. Come in today to tour our center.
" Creative Beginnings teaches our children to be good citizens, to respect themselves and others, to be independent and thoughtful. Our daughter was extremely well-prepared for kindergarten, in large part because of the tools she received at Creative Beginnings. The schools emphasis on creative thinking, a love of books and socialization proved extremely useful to our kindergartener."